Rightstride ready to wear orthotics are different from other mainstream brands, because they offer a range of arch heights for each device. It is important that the arch is supported in its natural state and not forced into neutral, so with this in mind, the team at Rightstride created a unique range of orthotic devices to relieve foot pain. These ready to wear orthotics are the closest thing you will find to a custom fitted insole. 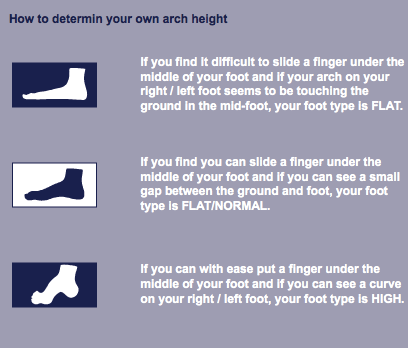 Use the Righstride guide below, to find your arch type. These specially designed orthotics replace the normal insole of your shoe where possible. They are lightweight and flexible, with a heel pad for increased shock absorption and energy return. Helping to relieve foot pain and improve function. All Rightstride products have been tried and tested for quality and performance to ensure that they offer you real value for money. These products have been extensiveley tested in the harshest environments, by men and women of our armed forces and on average lasted over 1 year in combat, often outliving the boots. You can expect to get about two years of every day wear from your Rightstride orthotics. The rightstride heel and arch pain orthotics are available direct from our clinic along with a full range of orthotics and insoles for every problem and every situation.